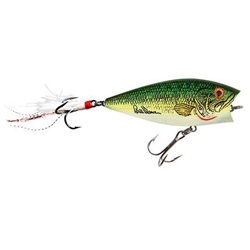 The Heddon Pop'n Image come in two different sizes: Standard 3" 5/8oz or Jr. 2-3/8" 5/16oz. Both accomplish topwater lures jobs of "popping" and "walking the dog." The Pop'n Image was designed for castability and come with Xcalibur rotationg treble hooks.